untamed: "THIS IS NOT CRICKET"
These incidents occurred during the recent ICC Champions trophy in Sept 2009. 1. Sri Lankan Angelo Mathews turned England fast bowler Graham Onions to square-leg and completed a first run comfortably but collided with the bowler going for a second run. Mathews, after being declared 'OUT' stood briefly at the pitch before walking back to the pavilion, but Strauss, England’s Captain, called the batsman back in a rare sporting gesture. 2. Only 48 hours after Strauss was praised for his sense of fair play by withdrawing a run-out appeal against Angelo Mathews, he allowed no liberties against South Africa when he refused Graeme Smith, South African Captain's, request for a runner when Smith was cramping after scoring a century. 3. In another match England's Collingwood, possibly one their best batsman obviously wasn't going for a run; he was probably a bit hasty in leaving his crease and New Zealand were in their rights to appeal. Collingwood was declared 'OUT" but the New Zealand Captain Daniel Vettori, in a sportsmanship act, called him back. The issue here is the difference between SPORTSMANSHIP and RULES. Gilchrist and Sangakara walk when they know they are out. Basically most Australians will not leave their crease till the umpire lifts his finger. In both cases they exercise their personal choices and are right in their own way. What is the Umpire for ? In my opinion these issues should be judged by the umpires with the fielding captain making a FINAL decision whether to call the batsman back if he is declared out. Then I wonder if Smith or Strauss or Vettori would appeal to the umpire for the batsman "handling the ball" when a batsman is just picking the ball to return to the bowler before the umpire calls it the end of the over. Basically, he is out handling the ball is when the batsman deliberately handles the ball without the consent of the fielding side ( Law 33) or if a batsman is run-out(a la Mankad) when a batsman, whilst backing up, leaves the popping crease before the bowler has actually delivered the ball. Where this has happened, the bowler may attempt to run the non-striking batsman out. Getting a batsman out this way, though legal, is generally considered to be against the spirit of the game as the non-striker (usually )does accidentally leaves the crease. Another instance is,at the end of the days play when the umpire has not taken off the bails or called it the end of play, the player is Run out (A la Kalicharan, the West Indian left after the last ball of the day' play ended and was 'Run Out'). Will Gilchrist or Sangakara 'walk' or will Daniel Vettori say "not run out" (or sportingly call the bat in the spirit of the game)when it is the last wicket and 2 balls remaining to win at the end of the match? 1. In a Test Match between Australia and England, Graham Gooch, one of the best English batsmen was batting very well; he was on 133. Then Merv Hughes (Australian bowler) got a ball to lift and Gooch fended it into the ground from where it bounced - apparently - towards the stumps. Instinctively, Gooch pushed the ball away with the back of a hand. The Australians appealed and Gooch was given "OUT". 2. 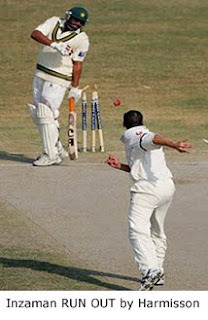 Steve Harmison appealed for a run out when Inzamam-ul-Haq took evasion action - but is given out, Pakistan v England, 2nd Test, Faisalabad, November 21, 2001 Inzamam played the ball back to Harmison. Harmison threw the ball back at the stumps. Inzamam moved away to avoid getting hit. The ball hits the stumps. Inzamam is out of his crease. Given "RUN OUT"
3. Inzamam-ul-Haq is declared out by umpires Simon Taufel and Asad Rauf for blocking a throw by Suresh Raina by his bat in the first India vs. Pakistan ODI in Feb 6, 2006; here again he took evasive action. Pakistan then required only 40 run from 41 balls to win the match with Pakistan with 5 wickets remaining. Given out "Obstructing the field". Australians, including Don Bradman, the Australian captain at the time, defended Mankad's actions. However, during the 1987 World Cup, when Courtney Walsh, the West Indian fast bowler could have done a ‘Mankad’ he graciously choose not to do so. Courtney Walsh requires praise for warning rather than dismissing Abdul Qadir who was backing up. The Aussies try to win by any means possible; particularly sledging, accusing people (eg.Inzaman Huq of ball tampering); wasting time by sledging or otherwise; their bowlers threatening batsman (e.g. Glenn McGrath to Kalicharan), etc. But when they get the response from the opposition they can’t take it. 1.Once Australian Wicket-keeper, Ian Healy's made a legendary comment which was picked up by the microphones when Arjuna Ranatunga called for a runner on a particularly hot night during a one dayer in Sydney... “You don't get a runner for being an overweight, unfit, fat c*nt!" 2. 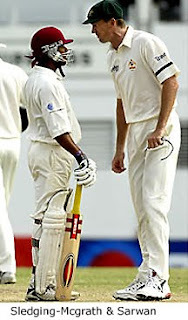 Sarwan, the West Indies vice-captain, and Australian Fast bowler, Glen McGrath went toe-to-toe in an ugly shouting match in Antigua in May 2003, The incident was sparked after Sarwan, was on his way to a match-winning second-innings century, reportedly reacted to lurid taunts from McGrath. McGrath: "So what does Brian Lara's d*ck taste like?" Sarwan: “I don't know. Ask your wife. " McGrath (losing it): "If you ever F*&king mention my wife again, I'll F*cking rip your F*king throat out." "The Ball does the talking"
In many cases the sledging does not just involve “talking” and the chitchat cannot be heard by the spectators. Sometimes it involves both mockery and gesticulations which are visible. A classic reply from a fast bowler after he has been hit for a boundary. See the video clip is from the quarter-final match between India and Pakistan World Cup 1996 in Bangalore involves Venkatesh Prasad (India) and Aamir Sohail (Pakistan). Sohail “sledges” Prasad by hitting him for a Boundary and arrogantly gesticulates. (Go Fetch That!). Prasad’s response is shattering the stumps with the next ball. The famous Imran Khan is the commentator. 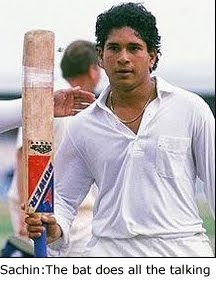 "The Bat does the talking"
The year was 1989, the little master, Sachin Tendulkar, had recently made his debut in Pakistan. He was not even old enough to get a driving license. Sachin Tendulkar was facing the best bowlers in the business. As the Pakistani crowd jeered and mocked Sachin holding out placards saying "" Dudh Pita Bhachcha ....ghar jaake dhoodh pee", (hey kid, go home and drink milk), Sachin sent the then young leg spinner Mustaq Ahmed hiding for cover (he had hit two sixes in one over. Then the legendary Abdul Qadir challenged Sachin saying " Bachchon ko kyon mar rahe ho? Hamein bhi maar dikhao ` (`Why are you hitting kids? Try and hit me.). Sachin was silent, since then we all have come to know that he lets his bat do the talking. Sachin obliged him by hitting 4 sixes in the over, making the spinner regret his sledging. The over read 6, 0, 4, 6 6 6, David had felled Goliath ... and a legend was born. The bat did the talking. I say Sportsmanship is the "Immediate state of the Mind at any particular moment". When you are an amateur you are sporting, but as a Pro, you do what it takes. However, since there is an Umpire, you have to go by his decision. Sledging should be included in the “Rules of Cricket” and umpires /match referee should act by these Rules. NOW IT IS YOUR CALL! great read. I would love to follow you on twitter. By the way, did you hear that some chinese hacker had busted twitter yesterday again. interesting stuff, would appreciate more interesting stories especially from the past..70s - 90s the golden years of cricket.